As part of our work with the Lab Haverfordwest – a three year arts and regeneration project, spacetocreate took a lead in developing Ideas Lab, which since launching in February 2016, has worked with small scale projects to test ideas for arts and regeneration in Haverfordwest. 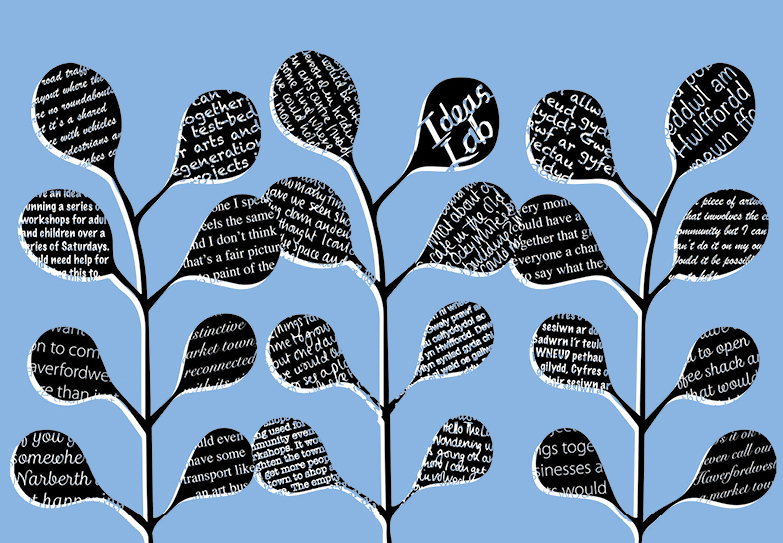 Over the three years, Ideas Lab provided support to enable 18 micro projects to get off the ground. Haverfordwest festival week in 2016 played host to a number of these projects designed to change perceptions of the county town, engage people in the arts and increase understanding of what art can be. Breaking out of the Gallery (BOOTG) showcased art on the streets of Haverfordwest, whilst local artists from the Haverfordwest pop-up studios inhabited three Artsheds located along the river throughout the festival. The success of these projects in 2016 led to the development of another series of art projects for the 2017 festival. The Lab worked with artists and organisations to put together a series of events themed around the idea of place making. Some, such as Little People, the Poetry of Haverfordwest and Something Fishy were developments of ideas that had initially been bought along to the ideas lab, whilst others evolved out of earlier projects such as Seren and Film$4Change.